Kauf - Through The Yard. Background promo - If you've ever needed a soundtrack to your existential crisis, Kauf has made exactly that. Who hasn't pondered the existence of God or the meaning of life while going full throttle on the dance floor at Berghain? Kauf has achieved the nearly impossible feat of making music rooted in a dance aesthetic but that is also lyrically deep. There just aren't that many records out there that could work in a club and also touch on emotional conflicts with your family and society at large. The project of Ronald Kaufman, Kauf took shape after moving back to his birthplace of Los Angeles. 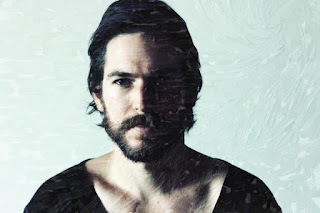 He self-released his first single in 2011 - "Relocate" b/w "When You're Out," which quickly found its way into the hands of Dan Whitford of Cut Copy who released the "As Much Again" EP on his own Cutters Records. Sorority Noise - Either Way. 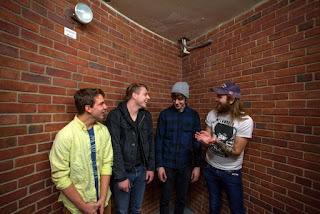 Background promo - Ahead of the band’s first ever UK dates, headlining and in support of Modern Baseball, Sorority Noise announce a new EP for Topshelf Records, “It Kindly Stopped For Me”, the follow-up to their critically acclaimed 2015 album “Joy, Departed”. The EP was recorded and produced by the band with exclusive artwork from Mitch Wojcik. Background promo - Jaye Bartell's move to Brooklyn, NY in 2013, as well as the work of Spalding Gray and Eileen Myles, heavily influence the content presented on his latest record, Light Enough. In his own words, "Resettlement is an implicit theme in much of the writing, and the process of making the album itself was an act of resettlement, finding out where I lived as a means of coming to live there." 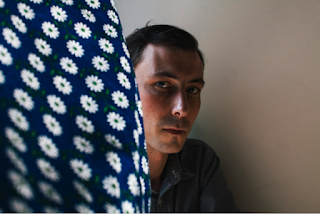 Bartell spent about a year secluded in his Greenpoint bedroom, piecing together the intricate tunes and gentle melodies that furnish his new record. Lecia Louise - Shock Me. Background promo - “Shock Me” is the brand new single from Brisbane’s Lecia Louise, just released ahead of her east-coast launch shows later this month. Since her musical beginnings in 2005 with the release of her debut EP ‘Heaven or Hell’, Lecia Louise has been a force to be reckoned with. Lecia has an impressive touring history that has seen the award-winning guitarist/singer/songwriter travel the four corners of the globe since 2006 performing to audiences throughout The UK, Europe, Abi Dhabi, Dubai, Rome, Singapore, New Zealand and Hong Kong. 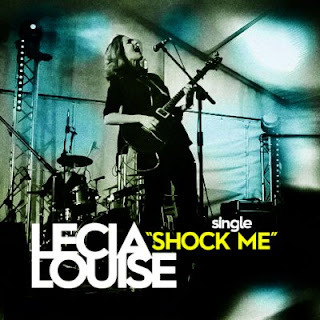 On February 19th, Lecia released her first new single in two years titled “Shock Me” which continues to showcase her upbeat guitar laden, rock/pop offering. “The song is about a man who ‘trades in’ his long term girlfriend for an 'updated model, a more edgier version',” says Lecia. “But in the end she doesn't actually make him any happier”. From the Internet Archive (IA) this is Death Cab for Cutie live at the Arvikafestivalen back on the 5th July 2008. Arvika Festival was a music festival that took place in Arvika, Sweden every year from 1992-2010 around mid- July. The event ceased when the organisers went bust. From the ever 'reasonably' reliable Wikipedia we are told - Death Cab for Cutie is an American alternative rock band, formed in Bellingham, Washington in 1997. 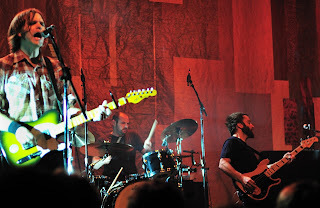 The band comprises Ben Gibbard (vocals, guitar, piano), Nick Harmer (bass) and Jason McGerr (drums). In 2014, founding guitarist and producer Chris Walla announced that he would be departing from the band after recording their eighth studio album, Kintsugi. 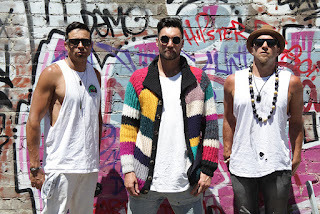 Background promo - Three Kiwi (New Zealanders) brothers (most likely from different mothers) maybe they met in Australia in 2012 on Sydney's Northern Beaches, maybe they met on Mars, maybe they met by a bin fire floating wayward on a raft between the North and South Islands of Aotearoa as the full moon kept us moving... Either way three brothers met, and they met to make music to make you sway and dance and swing and sweat. Music to make love to the mind, soul and ears of your sister, your wife, your mistress, your Nanna, to your sweet baby mama. They met to sing of love and trouble, of leisure and life.